All transactions are safe and secure with a reliable history in online purchasing behind each of our associates. 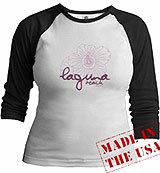 Buy the Laguna Beach Flower Logo t-shirt to own Laguna Beach clothing and merchandise. This stylish purple design includes the outline of a flower blooming above the title of the show, which is printed in cursive font. The design is available on over 120 items, including t-shirts, tank tops, and sweatshirts (a black-sleeved Jr. Raglan is pictured on the left). The tropical look of the design is perfect for a cool summer night at the beach, or a casual day spent wading in the surf as you listen to the MTV Laguna Beach Soundtrack CD. In addition to the Laguna Beach Flower Logo tee above, browse the Laguna Beach Clothing Gallery for more apparel like men's and women's clothes, kids shirts or hoodies.